7/2010: Some of the buildings have been demolished, but the main structures remain. There has been an on going debate between the two co-owner municipalities and a developer over the site’s redevelopment. The town of Spotswood wants age-restricted housing, while the developer does not want age restrictions. The developer has been encouraged to reuse the remaining mill buildings, but their future remains unclear. 7/2012: The developer has settled with both Helmetta and Spotswood to create 200 non-age-restricted units on the property, 180 of which will be within the rehabilitated historic mill buildings, and 20 of which will be new construction. The project is expected to cost approximately $35 million and construction is shceudled to commence in Spring 2013. The Borough of Helmetta is inseparable from its snuff mill. (Snuff is powdered tobacco ingested by snorting.) In 1880 George W. Helme, a former Confederate general, bought land between Jamesburg and Spotswood for a mill to produce snuff and related products like chewing tobacco. Helme named the area after his daughter Antoinette who was known as Etta. Helmetta was a classic company town. The mill employed most of the residents; they lived in company-owned housing, and they shopped with company-issued scrip at the company-run store. The roughly fourteen-acre mill complex, which has been vacant since it ceased operating in 1993, is the focal point of the community. It abuts residential neighborhoods on two sides, railroad tracks on a third, and the Main Street on which are found a general store, Borough Hall, a few churches, and large Victorian homes. The Borough has little evidence of suburban sprawl and retains an almost old world charm. But Helmetta has declared the entire site an area in need of redevelopment and because the state’s Redevelopment law does not protect historic resources, the Borough’s plan that includes demolishing this State and National Registers listed site does not require review by the NJ Historic Preservation Office. Rather than consider adaptive reuse of the buildings that give the Borough its distinctive character, the Mayor and Council have entered into negotiations with a developer who proposes to demolish the entire complex to build a nondescript mixture of housing, retail space, and some public facilities including basketball courts. PNJ sees no reason why borough officials cannot summon a little vision and foresight. 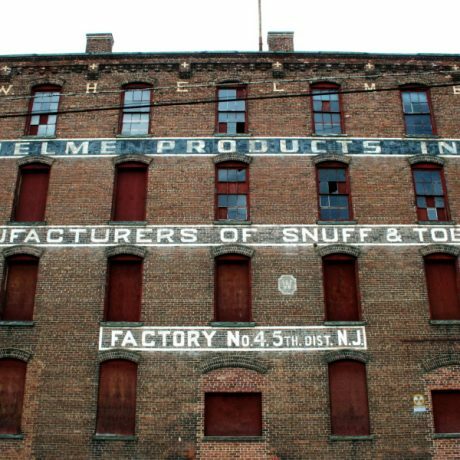 They could protect the distinctive character of Helmetta and simultaneously promote smart growth with a plan incorporating the existing buildings of the snuff mill complex into their redevelopment plan. 07/06 Cleanup of the snuff mill site, including landscaping, has begun. The redeveloper is examining the possibility of preserving some portions of the mill and incorporate it into the development plan.